Roughly bounded by Central and Seventh avenues, Missouri Avenue and Camelback Road. Walking along Medlock Drive between Central and 3rd Avenue is undoubtedly the best way to appreciate the Medlock Place Historic District. As you pass gorgeous 1920s and 30s homes on deep irrigated lots with lush green lawns, the huge trees will keep you shaded. The curbless streets add a rural touch to this picturesque neighborhood of English Tudor and Spanish Colonial Revivals and late Bungalow style homes on oversized lots. Farther north or west in Medlock Place Historic District, the homes are a bit newer and are typically Ranch or Transitional Ranch-style homes built in the 40s and 50s on a more standard-sized city lot. Whichever your preference, Medlock Place Historic District offers great homes in a great location. A rural suburb when it was developed, Medlock Place is a highly walkable and connected neighborhood today with retail shops and restaurants on all edges. Imagine being able to walk to Postino Central (5144 N Central ) for a glass of wine on a Friday afternoon and never have to worry about finding a parking spot, or to AJ’s Fine Foods (5017 N Central) when you find you’re low on milk. The light rail station is just steps away at the corner of Camelback & Central, so you can leave the car at home when you’re heading to a ballgame at Chase Field or to the Science Center with the kids. Something about Medlock attracts a creative bunch. Many of the homes here have been updated with style, with kitchens made for entertaining and additions that have been thoughtfully planned out. Even so, the homes keep their original historic flavor—each of these homes is entirely unique from the one next door. 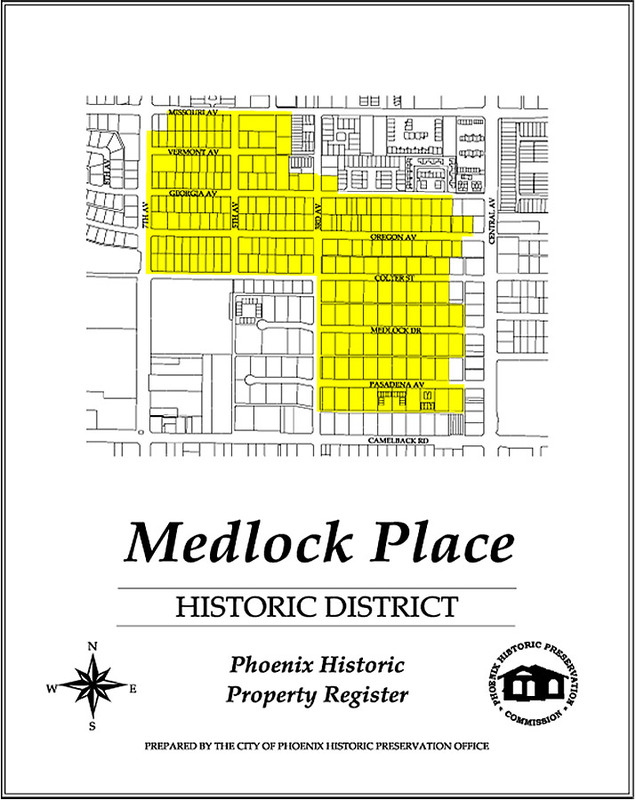 As far as historic homes go in Phoenix, Medlock Place homes are on the larger side, averaging somewhere around 2000 square feet. That and the rural feel (those mature trees that seem to beg for tree houses) make Medlock homes perfect for young families. Before and after the Electric Light Parade that travels Central each December, you’ll find neighbors and their kids (and the friends who come from elsewhere in town for the festivities) gathered over hot chocolate in one or another of these beautiful homes. If you love the Medlock Place Historic District for its unique location, you may also like the neighboring historic districts–Windsor Square to the east of Central and Pierson Place on the south side of Camelback. If it’s the homes on large lush lots that appeal to you, consider the Alvarado and Los Olivos historic districts a few miles south on Central.